Last week, we looked at the puzzle of counting the number of squares on a chessboard. This week, a quick little puzzle about how to make a square with an area of a non-perfect square number. 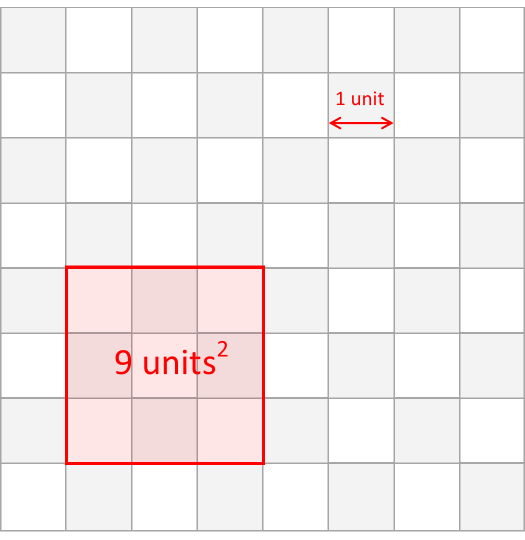 If we have a regular chessboard, with each small square having an edge of one unit, it's pretty easy to see how we can make a square of 9 units2 (by selecting any region which is 3×3 in shape). 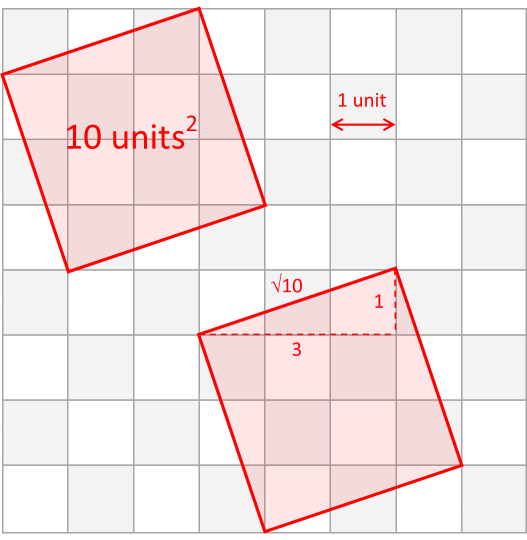 The question is, how can we use the same chessboard to define a region of exactly 10 units2? How can we make a square of 10 square units? A square does not need to be parallel or perpendicular to the board. If a square has an area of 10, what is the length of each edge? The answer, of course, is that the squares can be at an arbitrary angle, and we don't need the vertices to be on the same row or column. We can get a line of length √10 by using the hypotenuse of a right angle triangle with sides 3 units and 1 unit. Of course, this is not the only integer area square we can make. Using a combination of stair-steps we can make squares with other areas. We can see from Pythagoras that the edge of the square will always the square-root of the sums of the squares of the horizontal and vertical staggers, and since we square this edge to get the area, the area will always be an integer number of units. 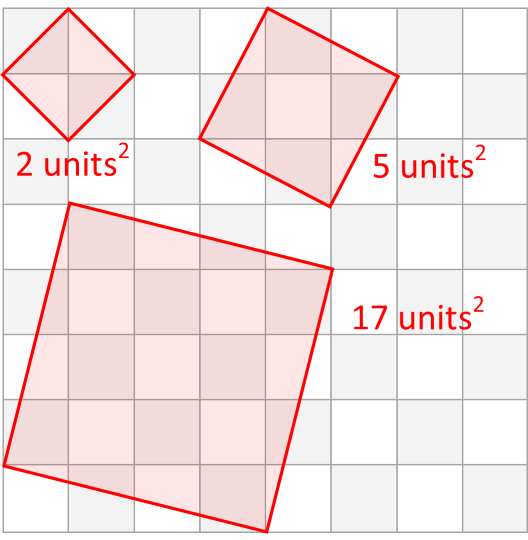 The area of the square will always be an integer number of units. Here is a complete list of all the integer unit area squares we can make on a chessboard (sorted in order). It's a mixture of those that can be created 'naturally' with sides parallel to the grid, and the 'bias' squares. Some of the bias squares are simple multiples, for instance the square formed by 2:4 has an area four times that formed by 1:2. If you look closely, you will see that 25 appears twice in the table. It's possible to make a square of 25 square units two ways: One the conventional way, and one with the edge formed by a 3–4–5 triangle. 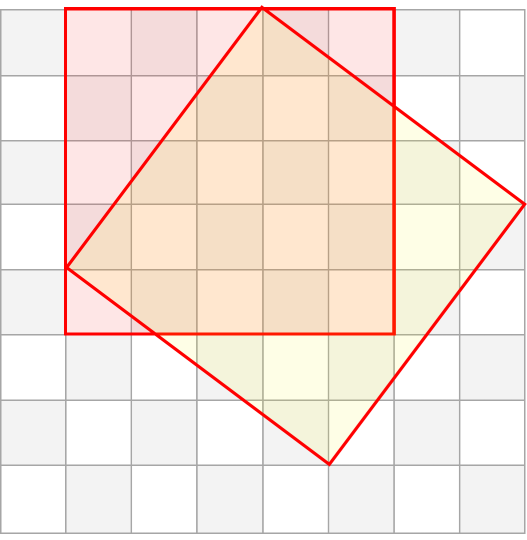 This is the only square that can be made two ways on an 8×8 board.